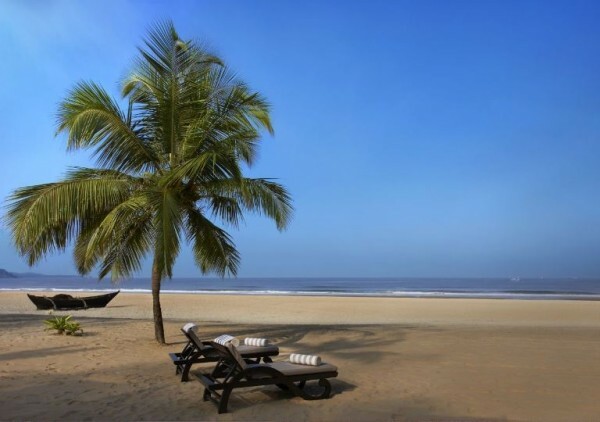 A gorgeous beach wedding in Goa awaits you..
Before we come to luxurious wedding hotels in Goa for your destination wedding, imagine balmy beaches lined with towering coconut trees, which is the quintessential definition of Goa. 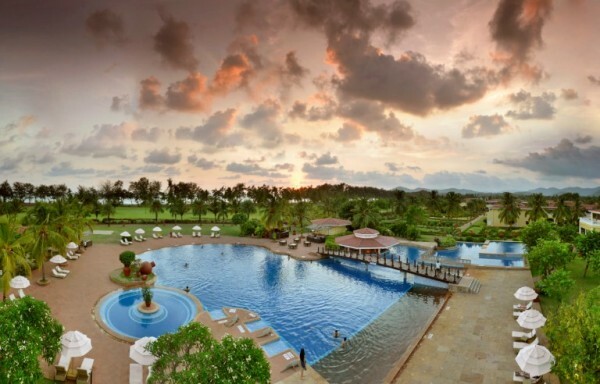 Though that alone could be a reason enough to lure you plan your destination wedding in Goa, but then again the charming city of Goa is so much more. While the etched imprints of Portuguese culture gives this city a rather pleasing character, its bohemian and laid back aura has a sort of seductive effect about it. 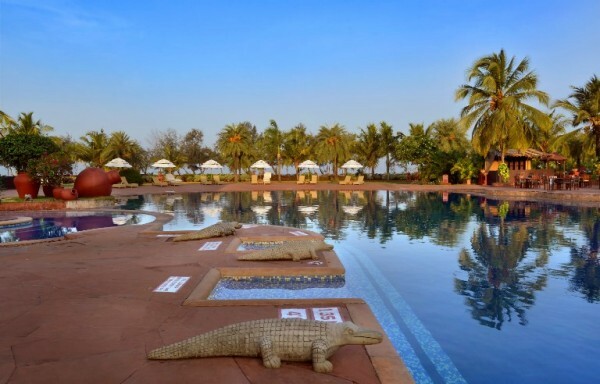 Located at twenty minutes’ drive from the Dabolim airport, this is one of the properties where when we take our client for recce trip, we know they would want to have their destination wedding here. 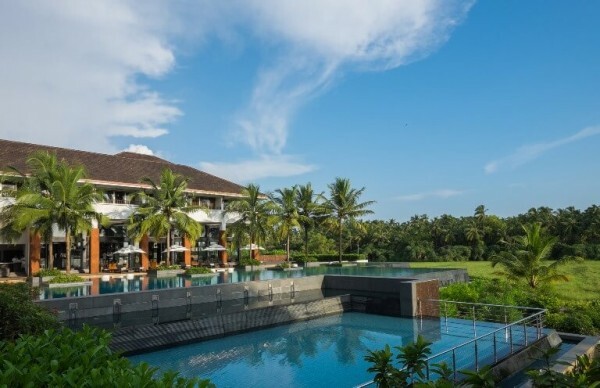 This hotel is as close as you could get to creating Indo Portuguese hamlet, striking architecture with its free form pool cocooned with palm trees, is landscaped over multiple levels offers views of the Arabian Sea. Cocktail evening by the poolside or in its gardens would be high dose of fun. Its award winning Spa offers holistic wellness treatments and massages which we need say is a good idea for a laid back ladies evening or a bridal party. Bond with your girls over mani and pedi and some margaritas. Intimate dinner or champagne brunch could be organized at the Boathouse, venue overlooking the cluster of lagoons or at The Verandah, a charming hall overlooking the gardens. 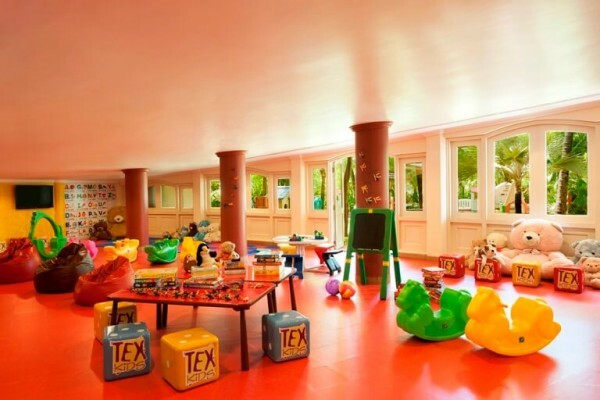 The younger guests wouldn’t be disappointed here; they can enjoy an adventure at Camp Hyatt or take a few laps at the kid’s swimming pool. The big piece of information is they have their own private beach, so we reckon beachside wedding revelries are in order. 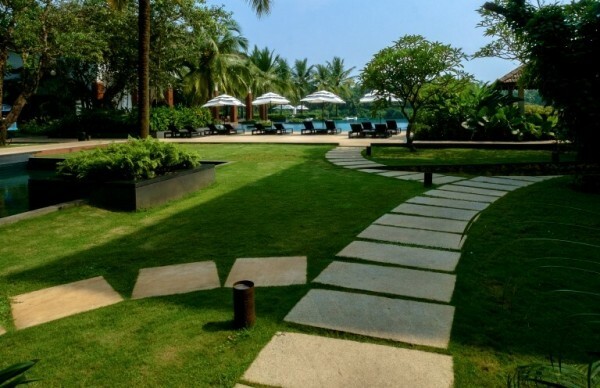 Whether you choose seaside lawns or their enchanting little forest, wedding here would be wonderful, there’s no other way around at Park Hyatt. 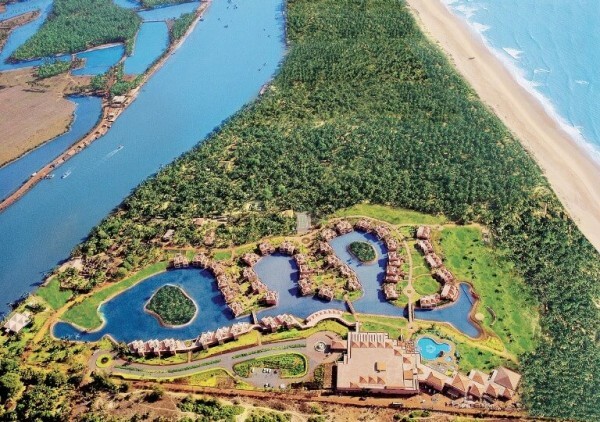 Located at the other end of Goa, it is bit of a drive from Dabolim airport, but when you reach here, you almost sigh: well it was absolutely worth it. 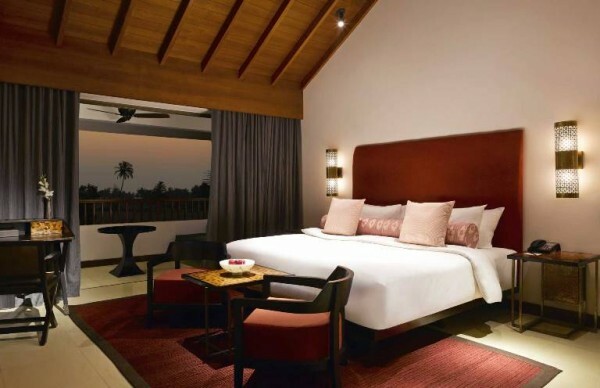 An all suite property, it’s like Lalit has put the best of everything luxury and modern day hospitality into blender and churned itself out. 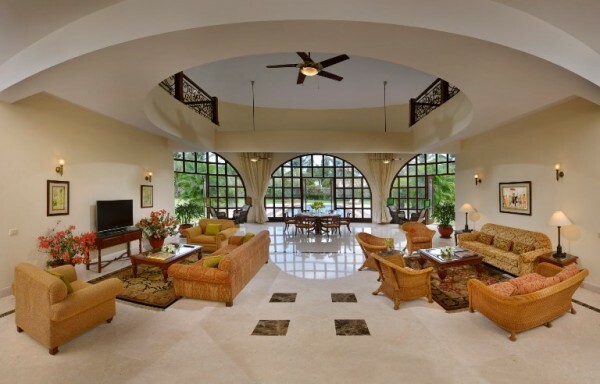 Portuguese inspired architecture and décor, an international standard expansive golf course, a kilometer long beach front, palatial villas, water sports, dolphin trips, holistic spa, restaurants offering gastronomical delights. You could have a beachside ceremony (if you are their in-house guests, that is) or at their sea facing lawns. 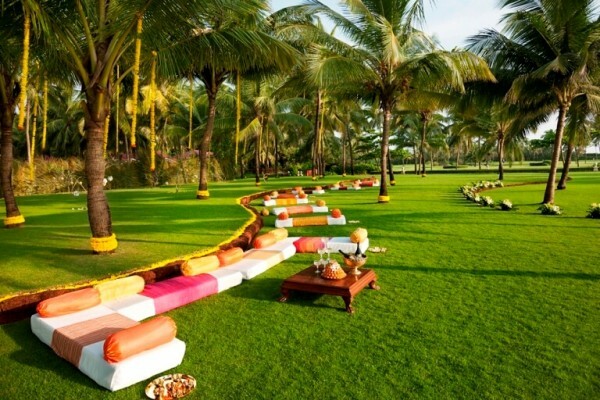 Set up for functions like mehendi or cocktails could be made by the poolside. 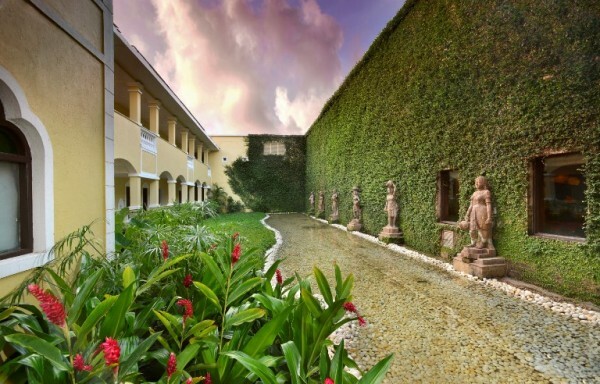 Their landscaped gardens offer a gorgeous backdrop for your special day. 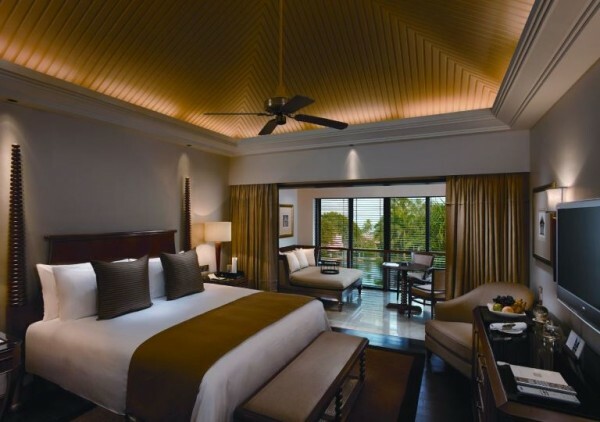 The Leela chain of hotels has a signature uber luxury thingy and this one aint any exception. 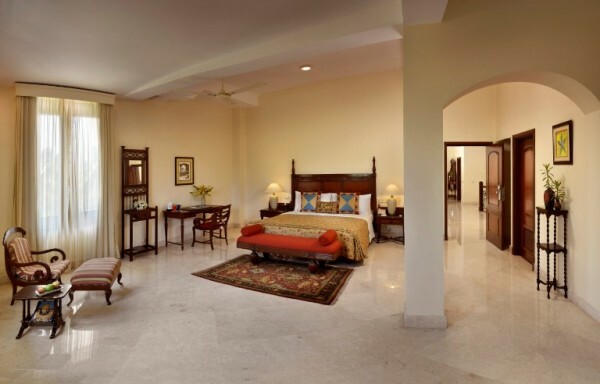 The elegantly luxe ad palatial property has been designed drawing influences from Vijanagar and Portuguese architecture. 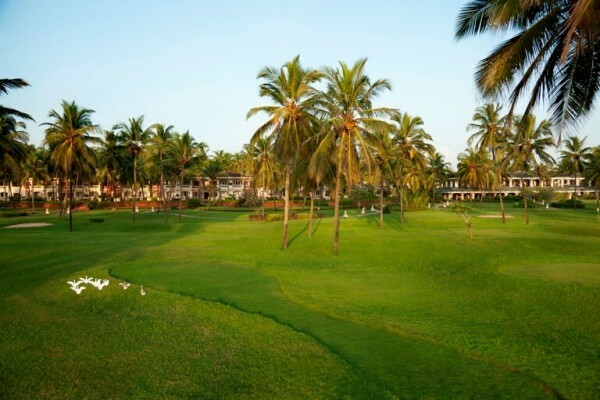 Acres of verdant lawns with the views of pristine beach, coupled with its almost reclusive location, make it a rather enchanting property. 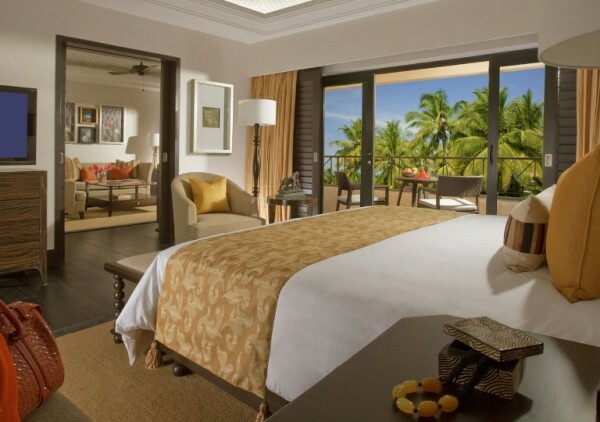 We quite like their lagoon facing rooms and suites. 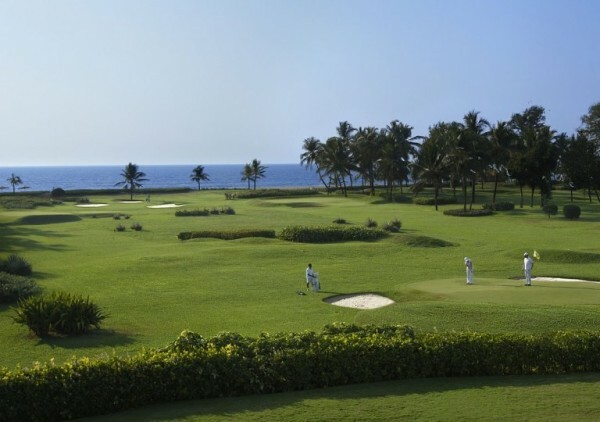 The 12-hole golf course and a wellness spa are perfect excuses for you and your guests to unwind and relax. 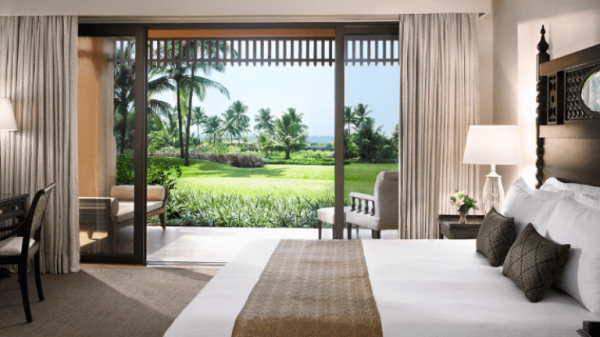 You could get married at their Leela lawns overlooking the beach, though they are a bit distant from the sea or the coconut grove. Intimate brunch or cocktail could be organized at their Italian Riverside restaurant which has dreamy ambience. 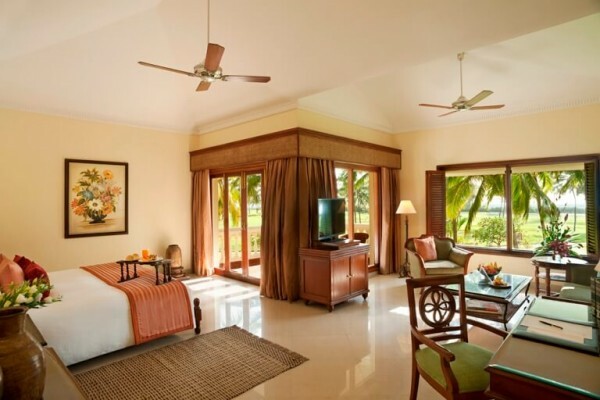 Leela is relatively more expensive as compared to the other five star properties but then again its one of the best luxury beach resorts in Goa. 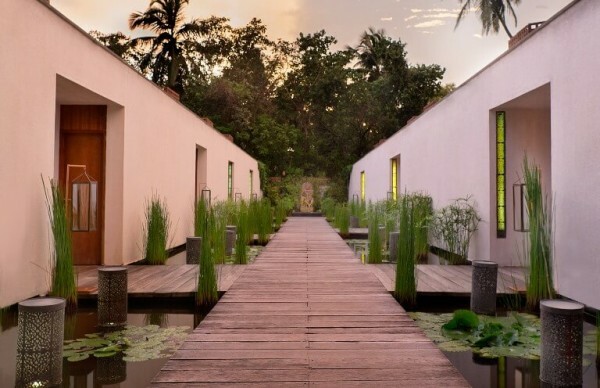 The Mediterranean inspired resort is a great spot to unwind and slip back into the much coveted laid back and languid Goan life. 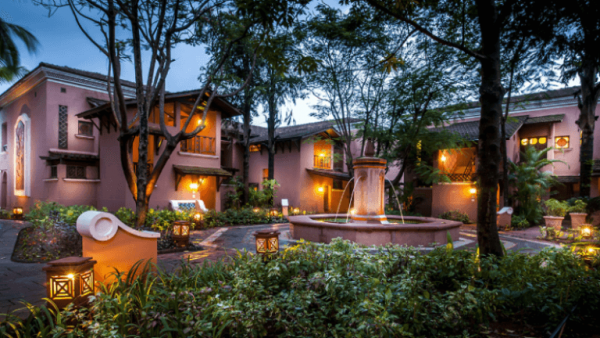 Located at forty minutes drive from the airport; its flower lined patios, sunshine kissed atrium, coupled with old world architecture makes it a charming wedding hotel. 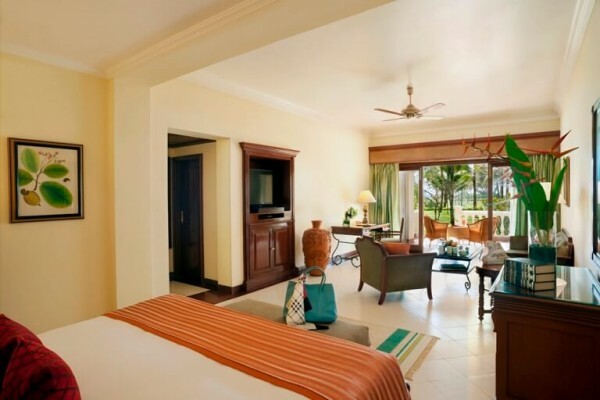 You and your guests could choose to stay in their deluxe, luxury or villa rooms. 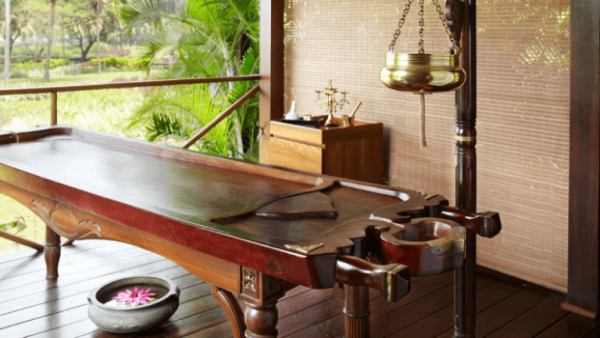 Relieve your wedding stress or have a day with your bridal party at their Jiva Spa. 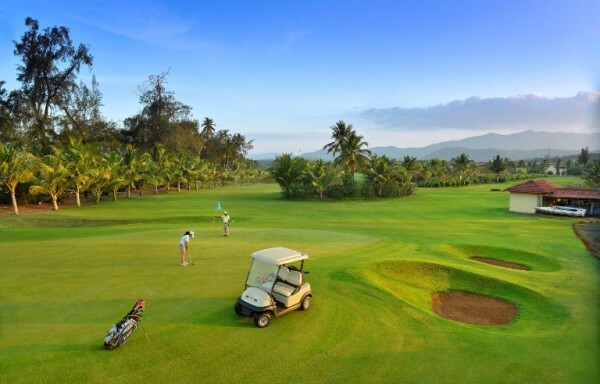 Its sea facing well manicured lawns (are one of the best in Goa) is the main venue for organizing your wedding event. There’s also couple of banquet halls where we could organize formal dinner or other pre/post functions. Situated amidst paddy fields and silhouetted by palm trees, Alila Diwa is a design harmony, an agreeably different venue for your wedding. 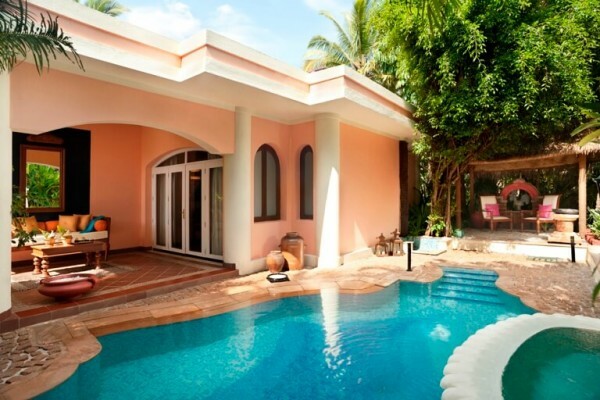 Beautifully landscaped lawns with water bodies hither and thither, and a traditional Goan courtyard, the serene and sensuous property will win you and your guests over. Add to that their warm hospitality and attention to detail, you would be glad to have chosen it for your special day. 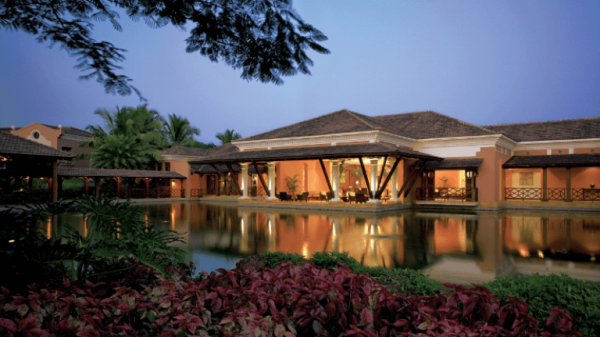 It has an array of venues to tend to your many pre and post wedding functions. 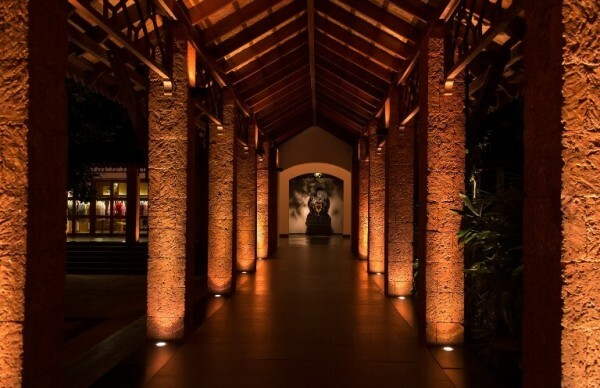 Wedding ceremony at Alila Diwa could be organized in its pillar-less ballroom and then flow into adjoining gardens. For intimate wedding or mehendi or sangeet you could choose from their pool deck, overlooking the paddy fields or the courtyard or at their enchanting al fresco restaurant Spice Studio. 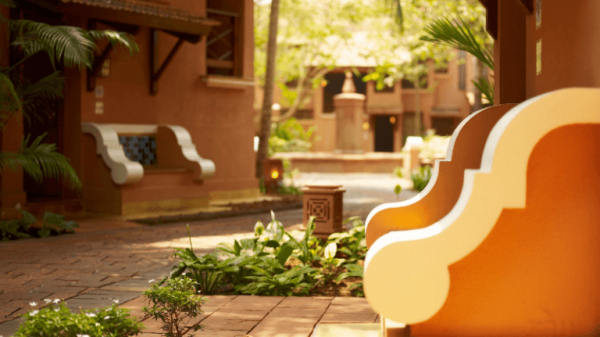 Be its cashew wine – Feni or romantic ambience or carefree culture or vibrant nightlife or beaches, Goa will make for a wonderful wedding destination. And these properties are a proper fix your destination wedding soiree at the beach city. 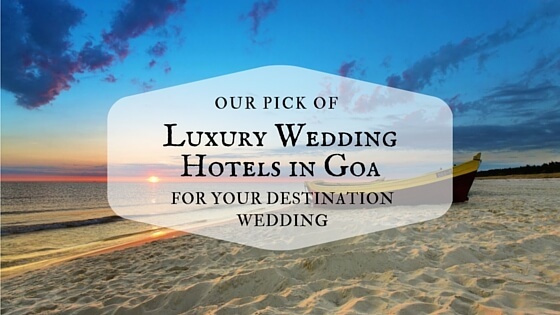 Still a bit un-decided or you have made up your mind on which wedding hotel in Goa to choose, in either case let us know and we would happy to help you plan your destination wedding in Goa or we may say at the beach city. FILL UP THIS FORM WITH YOUR DETAILS AND REQUIREMENTS AND WE WOULD GET BACK TO YOU IN NO TIME.